All in all, this recipe is exactly what you need if you often find yourself skipping breakfast in the morning and looking for something quick and easy to make, like a breakfast sandwich. 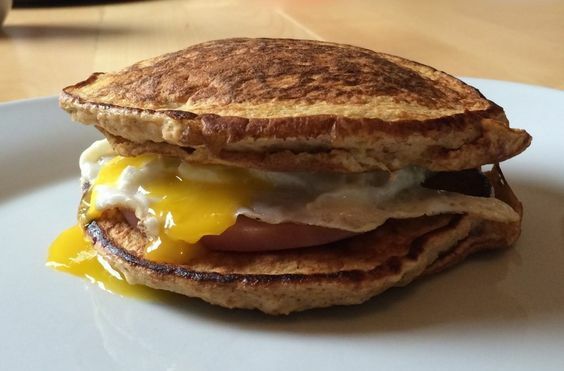 As a matter of fact, considering how versatile this “made from scratch” breakfast sandwich is, you’re bound to improvise and use up whatever you have in your fridge that day. Even if you’re not a breakfast lover, you’re about to be converted. Indeed, you’ll find yourself stepping away from your “hard boiled eggs only” breakfast and making this absolute lifesaver. Moreover, the whole thing only takes 10 minutes to make! Firstly, mix the almond flour, almond milk, and egg together in a glass measuring cup. Then microwave on high for 2 to 2 1/2 minutes. Dump out of measuring cup onto a plate. Then slice in 2. Next, grill English muffin halves on a skillet to brown. Then use butter, ghee, coconut, or olive oil if needed. Then fry egg and bacon on a skillet. After that, layer egg, bacon, and avocado on the English muffin. Finally, season with salt and pepper or hot sauce if desired.